2 core screened cable is one size of control cable. It is usually used as interconnecting cable for measuring, controlling regulation in control equipment, which is for assembly and production lines, conveyors and for computer units. 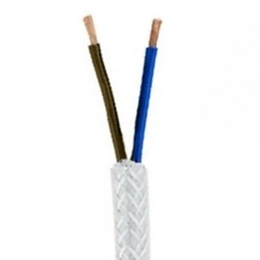 2 core shielded cable is suitable for fixed installation or flexible use under light mechanical stress. Meanwhile, 2 core copper wire has the common features with all control cable. 2 core control cable has armored 2 core screened cable and unarmored 2 core copper cable, 2 core shielded wire and unshielded 2 core control. You can choose them according to your demands. Of course, you can send us your demand to us, we will provide you best 2 core shielded cable price. Email:sales@hdccontrolcable.com. Get the price now. Email:sales@hdccontrolcable.com. What should you know about cheap two core shielded cable? Two core shielded wire is a 2 core control cable with shielded. But do you know the function of screen? I think you should know this before buying low price two core screened cable. Email:sales@hdccontrolcable.com. The screen of 2 core screened cable is proving the transportation performance in the electromagnetic interference. There mainly are two aspects interference. The first is the ability to resist external electromagnetic interference, and the second is the system itself to radiate electromagnetic interference. So you can consider low price 2 core braid cable, it is screen interference very well. Tell us what you want, and we can help you. Email:sales@hdccontrolcable.com. How do you install high quality 2 core shielded cable? When you want to buy 2 core screened cable, a high quality 2 core shielded cable is very important. After you buy it, it is also important to install. Now I want to tell how to install low price 2 core shielded cable outdoors. When unarmored 2 core braid cable is directly installed outdoors in horizontally, the interval to the ground should not be less than 2.5 meters. When we install it vertical, the interval should not be less than 1.8 meters. So you should pay attention to these requirements. If you can’t achieve these requirements, there is a method to protect 2 core shielded wire form mechanical damage. You can install it in the power distribution room, motor room and the special room. I hope you will adhere to the standard, when you adopt this kind way. You can also contact us to get some suggest. Email:sales@hdccontrolcable.com. When you install 2 core copper cable side by side with the same voltage, the spacing of cables should not be less than 35 millimeters, and not be smaller than the outer diameter of cables. But if you install two core shielded cable in the bridge, cable tray and inner grooves, you can install according your demand. Two core shielded wire, which is less than 1 kv, should be separated. You can consider the way you install before installing. Contact us right now, we can give you a better idea. Email:sales@hdccontrolcable.com. If you want to install two core screened cable overhead, you must be careful about the heat pipe. The spacing between them should not be less than 1 meter. But the space is indeed less than 1 meter, you should adopt heat insulation measures. The spacing between 2 core control cable and other pipes should be less than 0.5 meter. When the spacing is equal or less than 0.5 meter, you should adopt some measures to protect 2 core control cable from technical damages. I am sure you have known these attentions, and I hope you can use it very well. By the way, as one of professional 2 core shielded cable manufacturers from China, we can provide you a cheap price with the best installation measures. So just contact us to get 2 core shielded cable price right now. Email:sales@hdccontrolcable.com. How to protect you from the bad 2 core screened cable? Some customers have some misunderstanding about high quality 2 core shielded cable. And some of them want to reduce the cost, so they choose the very cheap 2 core braided cable, some is even lower more than normal price. These kinds of low price 2 core shielded cable don’t have the quality assurance. So you can image their quality. Although their price may have some differences between different 2 core shiedled manufacturers, they won’t have too much difference. Email:sales@hdccontrolcable.com. Some private enterprises can’t meet the requirement of the standard in aspects of material selection, production technology, detection means. Their quality also can’t be promised. They may do short foot, and want to appeal customer with cheap price, but I want maintain you to be careful. Hot-sale products are waiting for you: 2 core control cable, 3 core shielded cable, 4 core control cable, 5 core screened cable, 6 core shielded cable, 7 core cable, 8 core shielded cable, 10 core shielded cable, 12 core control cable, 19 core cable and 30 core cable. Email: sales@hdccontrolcable.com. Huadong Cable Group is qualified by SGS, BV, ISO and so on. We can provide our quality 2 core braided cable. And we can also accept the third-party inspection. Of course, as a manufacturer of 2 core shielded wire, we can give you a good price compared with other suppliers. So just contact us right now. Email:sales@hdccontrolcable.com. We have exported 10 core shielded cable to many countries, so have have the rich experience and can solve your problems better. You can send us the inquiry free. Email:sales@hdccontrolcable.com.